This summer, visitors to Canada’s Ottawa Capital Region will experience new ways of connecting and discovering the many Capital sites and landmarks: Free Capital Wi-Fi in downtown Ottawa–Gatineau lets you access information with your smartphone, tablet or laptop as you tour Canada’s Capital Region. It’s all part of the contract that Bill Brooks, managing partner and CEO of PowerWave Mobile Engagement Inc., told us that his company had just won when we met at the Digital Brand Activation Summit in Toronto in April, 2012. PowerWave, with strategic partners SurfSpot Media, E-Port Systems and Crowd Muscle Research, all in Vancouver, B.C., had been awarded a five-year contract with the National Capital Commission of the Government of Canada. 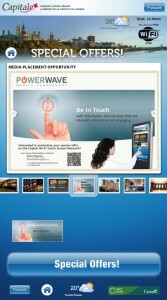 SurfSpot Media was to install and operate the outdoor wireless network (OWN). E-Port Systems’ interactive touch screens were to be installed and operated in locations to create the touch screen network (TSN). Crowd Muscle would provide data analytics and on-line research support for both networks that will be initially set up in the specific areas in the Capital Region. And PowerWave was named responsible for overall project management co-ordination, as well as the monetization of OWN and TSN by providing marketing and sales expertise over the five-year term of the contract. It’s now all up and running, as envisioned by the National Capital Commission (NCC) which has modernized its approach to visitor services by providing service where visitors are and maximizing the use of new technologies. Residents and visitors now have access, free of charge, to Wi-Fi service in high traffic pedestrian areas. In addition, he Capital Wi-Fi Network also features indoor Interactive Touch Screen units, which offer free wireless service (Hotspots). The units act as an electronic wayfinding application with content specifically designed for visitors such as maps, interpretation content and where special offers/deals taking place. “We will be monetizing thru the Special Offers section by selling media space to both national and local marketers and also looking for one exclusive lead sponsor for the overall Network,” says Brooks. 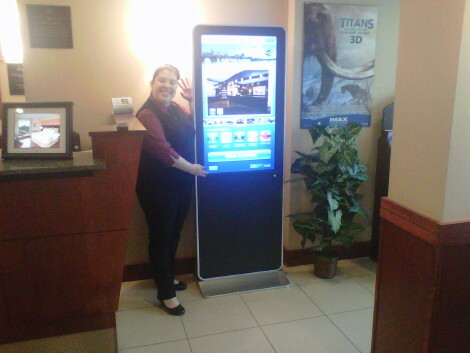 More than 40 Interactive Touch Screen units have been deployed at various locations in the Capital Region thanks to the collaboration of cultural, tourism and private partners. The NCC website has also been optimized for smart phones and mobile applications, with the content Visitor Information section redesigned to provide visitors with useful information before and during their visit. 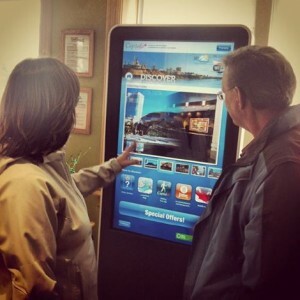 Another innovation is the Capital Tours free interpretive app with walking tours of Canada’s Capital Region. This multimedia enriched app currently offers tours of Parliament Hill grounds and Confederation Boulevard, the Capital’s ceremonial and discovery route. Visitors are invited to enjoy these free, GPS-enabled tour experiences, and more Capital Tours experiences will be added this summer. The bilingual staff at the Capital Information Kiosk at the World Exchange Plaza offers visitors: Itinerary planning and information for visitors regarding Canada’s Capital Region; the sale of museum passports, Gatineau Park and Greenbelt maps; an Internet accommodation reservation station; and a full program for brochure distribution. Further, the NCC has expanded its outdoor roving interpretation service that brings information officers directly to Capital visitors. The information officers, positioned along Confederation Boulevard and in high traffic visitor areas, are equipped with electronic tablets to provide on-the-spot information, orientation and interpretation services (May to September). And this is fun: a Decoding Art QR-codes program is available at various monuments. By scanning those codes with their smartphone, visitors get multimedia content in English or French. There are interpretation clips designed for both adults and children. This spring, the stories of the public art piece Balancing, the Canadian Firefighters Memorial, the National Aboriginal Veterans Monument, the public art piece Papa and Tin House were launched. Further, information and orientation tools (info map columns and map models) are provided along Confederation Boulevard, while interpretation panels about key Capital sites, views and vistas are also installed there. These visitor services are all in addition to the Discover the Hill program managed by the NCC. This entry was posted on Wednesday, May 29th, 2013 at 10:00 @458 and is filed under Scuttlebut. You can follow any responses to this entry through the RSS 2.0 feed. You can leave a response, or trackback from your own site.